stevereads: Great Moments in Comics! I overlooked a comics title last week, but that's just as well, because the comic I'd have written about contains another Great Moment in Comics, and last week I hadn't yet come up with that stellar concept - so the timing is better this way. Fear not: this week's comics will get all the consideration they're due! In the meantime, the moment in question comes in the 5th issue of the 6-issue limited series of Marvel reprints of the old Stan Lee/Jack Kirby "Tales of Asgard" backup feature that once ran in "Thor." You'll recall that I praised this reprint series not only because it's a damn refreshing odd choice for a reprint series (surely the monthly "Thor" comic can't be selling that well) but also because the reprints fantastically enhance the color, texture, delineation - the entire viewing experience of the originals. These reprints are done on high-quality paper, and the refurbished colors glow on the page; tremendous, picky care was taken in re-crafting these images, and it shows on every page. 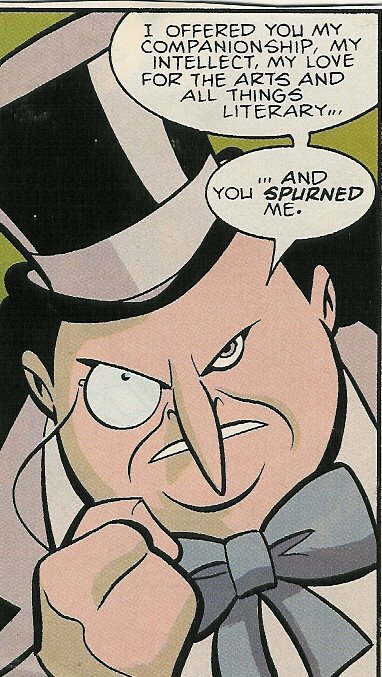 Issue #5 contains the highlight of the entire series, the issue I've been waiting for throughout the run. The storyline goes like this: a warlord in Muspelheim, Harokin, has seized the unbeatable Warlock's Eye (it's a gigantic helmet that blasts its wearer's enemies with unstoppable waves of energy) and is threatening to march on Asgard itself. Odin dispatches Thor and the Warriors Three (Hogun the Grim, Fandral the Dashing, and Volstagg the really, really fat) to stop Harokin and retrieve the Warlock's Eye, and while Hogun and Fandral are fighting Harokin's henchmen (Volstagg contrives to be elsewhere, not being much for the unpredictability - not to mention the exertion - of combat), Thor tackles the warlord himself. Since Harokin is only a mortal man, Thor flattens him with one punch, and pretty soon the Warlock's Eye is in his possession and Muspelheim is liberated. But it turns out Thor doesn't know his own strength - Harokin is dying (Harokin claims it's the result of a lifetime of fighting, but you don't accrue many injuries when your hat's doing your fighting for you). Shortly, Thor and his comrades hear a steady, ominous beat of muffled drums. "What foul infamy is this?" Volstagg asks. "Do they dare summon their forces against us once more?" But grim Hogun knows better: "It summons the great black Stallion of Doom! It means the death of a mighty warrior is near at hand!" Kirby's artwork is perfect here, full of shadows and frightened faces, as a black horse steadily clop-clop-clops toward Harokin's citadel. 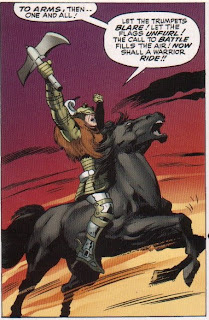 The warlord is too weakened to stand; his men dress him in his armor and prop him onto the Stallion of Doom - and just in time, as Volstagg notices first: "Dost thou not see? From out of the mists she hath come, she before whom all who live must one day bow! 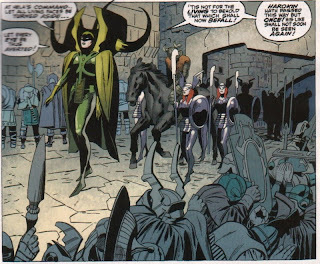 For she is Hela, the ever-emotionless goddess of death! And behind her ... the silent, unyielding Valkyrie Guard!" Towering, stolid Hela (who's shown up in these comics-entries before, as you'll recall - and if not, as always, just follow the labels at the bottom and do some catch-up reading!) and her valkyries lead the stricken, slumping Harokin away, until they reach the borders of their destination. 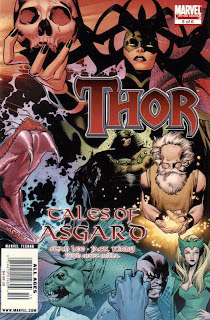 "Thus far have we journeyed," Hela says. "No further may Hela venture forth! That which lies ahead may be viewed by none but the valkyrie maidens ... and by him who rides the Stallion of Doom!" The horse moves forward across a glittering bridge as mists part and Harokin sees the towering hills of Valhalla and hears the enthusiastic calls of the warriors assembled there: "Know thou, Harokin, that death is more than an ending ... 'tis the greatest beginning of all!" And Harokin lifts his face. "The weariness doth leave my limbs! I feel new strength within me ... vigor, such as I have never known! The sound of battle - the clang of armor - the most joyous music ever heard! To arms, then ... one and all! Let the trumpets blare! Let the flags unfurl! The call to battle fills the air! Now shall a warrior ride!" It would be over twenty years before another "Thor" writer captured a similar moment with that kind of happy gusto (the true-blue geeks among you will know who I'm talking about, and perhaps even the precise issue - but if not, again, fear not! It, too, is a Great Moment and so will be featured here eventually), but in 1966, comics had seen nothing like it before. 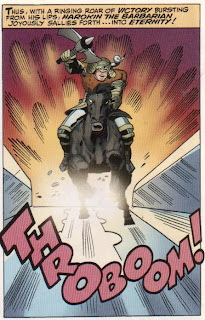 Glorious, dumb stuff, as all the best "Thor" moments invariably are! These reprints are done and it'll be the prettiest part about all this, on high-quality paper we can learn a lot of qualities and the refurbished colors glow on the page too. After studying this posting, I pondered the exact same level that I invariably marvel about when scanning new blogs and forums. Just what do I take into consideration this? Exactly how ought to it effect me? This and extra posts in your weblog proper right here definitely give some stuff to look at. I essentially ended up here by means of Yahoo once I was very first doing a little internet research for some course perform that I have. All the time excellent times looking via and I’m hopeful that you will keep on writing new posts. Cheers! wow. finally, I found something helpful for my paper to jot down about. that is attention-grabbing and helps me with more research within the future. Glad I found this blog.Thank you. And I do hope you'll expand some of your ideas about this subject and I will certain come again and read it. Thanks for the hassle and time. Hi, I used to be searching via the website looking for some data and arrived via your weblog. I'm amazed by the data that you've got on this site. It exhibits how nicely you comprehend this subject. Saved this web page, should come back again for long term. You, my buddy, ROCK!! !